Nathan Dyer scored twice as Swansea ruthlessly ended West Bromwich Albion's unbeaten start with a third win to briefly go top of the Premier League. Dyer finished off a slick move by running onto Gylfi Sigurdsson's flick to fire home after just two minutes. 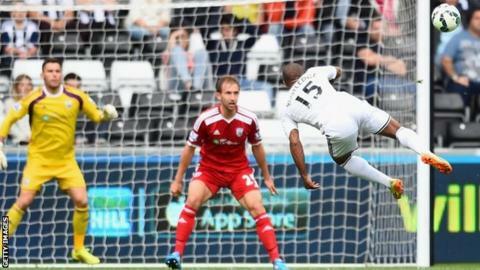 Wayne Routledge then met a headed clearance from Craig Dawson to double the Swans' lead with a stunning volley. Swansea created further chances after the break with Dyer stroking home his second from another Sigurdsson pass. Victory gave Swansea a third successive win for the first time as a Premier League club and, taking into account their progress in the League Cup, their best start to a season for 91 years. In contrast, there is plenty to ponder for West Bromwich Albion manager Alan Irvine who has overseen major changes at the Hawthorns but is yet to enjoy a league win. Albion confirmed their 11th signing of the transfer window before kick-off, with Argentine winger Sebastian Blanco joining for an undisclosed fee. Blanco, along with fellow new recruits Silvestre Varela, Joleon Lescott and Georgios Samaras, was unavailable and Irvine will want them involved as soon as possible. After seeing off League Cup opponents Rotherham in midweek, Swansea boss Garry Monk reverted to the side that had beaten Burnley a week ago courtesy of another Dyer goal. The Englishman was to strike even earlier against West Brom, receiving the ball from Sigurdsson and rounding Ben Foster before slotting the ball home. Swansea were not prepared to sit on their lead, Wilfried Bony clearing the crossbar with a shot and a header and Jonjo Shelvey also going close. The visitors were struggling to get into the game and fell further behind when Dawson's headed clearance fell straight to Routledge on the edge of the area, and the winger scored his first goal of the campaign with an acrobatic volley. Things could have got still worse for the beleaguered Baggies when Routledge's ball into the area was headed onto his own bar by Jonas Olsson. Brown Ideye, making his first Premier League start, had a low shot saved by Lukasz Fabianski at the other end but a long-range effort from the Nigerian that sailed harmlessly past the post better summed up Albion's forgettable first half. The visitors made a more positive start to the second half, although Olsson's header from captain Chris Brunt's corner drifted harmlessly wide. But Swansea remained in control as goalscorer Routledge made way for Jefferson Montero, who provided a low cross for Bony to blast over from close range. The home side sealed victory with the same players involved in the first goal featuring once again. Sigurdsson, a pivotal figure in their previous two league wins, threaded a ball through for Dyer, who outpaced the West Brom defence and slotted past Foster for a second time. West Brom rallied late on with Stephane Sessegnon hitting the crossbar and Fabianski parrying substitute James Morrison's fierce drive. But it was as much as they could offer against a Swansea side who are growing in confidence with every game. Swansea manager Garry Monk: "It's a good start but that's all it is. There's a long way to go and a lot more work to do, but it's good to have the winning habit. "We know what we are. We'll try to get to that 40-point barrier as quickly as possible, that will always be our target. "It's only our fourth year in the Premier League and expectations come with winning games but we have to get there as soon as possible." West Bromwich Albion manager Alan Irvine: "We lost 13 players over the summer and so had to replace all of them. "But the players we've signed have taken longer - for a variety of reasons - to get them in. "We brought in a number of lads who weren't attached or weren't training with their clubs and we've got to try to get them up to speed. "We've got players who are in desperate need of a pre-season and we've got to get them working together as quickly as we can." Match ends, Swansea City 3, West Bromwich Albion 0. Second Half ends, Swansea City 3, West Bromwich Albion 0. Hand ball by Youssuf Mulumbu (West Bromwich Albion). Attempt missed. Craig Dawson (West Bromwich Albion) header from the centre of the box misses to the left. Assisted by James Morrison with a cross following a corner. Corner, West Bromwich Albion. Conceded by Neil Taylor. Substitution, Swansea City. Tom Carroll replaces Jonjo Shelvey. Attempt missed. Youssuf Mulumbu (West Bromwich Albion) right footed shot from outside the box is too high following a corner. Corner, West Bromwich Albion. Conceded by Lukasz Fabianski. Attempt saved. James Morrison (West Bromwich Albion) right footed shot from outside the box is saved in the top right corner. Assisted by Stéphane Sessegnon. Attempt missed. Jonjo Shelvey (Swansea City) right footed shot from outside the box misses to the left. Assisted by Bafétimbi Gomis. Corner, West Bromwich Albion. Conceded by Ashley Williams. Attempt blocked. Saido Berahino (West Bromwich Albion) right footed shot from the right side of the box is blocked. Assisted by James Morrison with a through ball. Delay in match (West Bromwich Albion). Corner, West Bromwich Albion. Conceded by Jonjo Shelvey. Attempt blocked. Craig Gardner (West Bromwich Albion) right footed shot from outside the box is blocked. Assisted by James Morrison. Stéphane Sessegnon (West Bromwich Albion) hits the bar with a right footed shot from the centre of the box. Attempt missed. Jonjo Shelvey (Swansea City) right footed shot from more than 35 yards is close, but misses to the right. Assisted by Wilfried Bony. Ki Sung-Yueng (Swansea City) is shown the yellow card for a bad foul. Craig Gardner (West Bromwich Albion) wins a free kick on the left wing. Substitution, West Bromwich Albion. James Morrison replaces Chris Brunt. Substitution, West Bromwich Albion. Cristian Gamboa replaces Jason Davidson. Goal! Swansea City 3, West Bromwich Albion 0. Nathan Dyer (Swansea City) right footed shot from the right side of the box to the bottom right corner. Assisted by Gylfi Sigurdsson with a through ball. Corner, West Bromwich Albion. Conceded by Jefferson Montero. Hand ball by Nathan Dyer (Swansea City). Attempt missed. Wilfried Bony (Swansea City) right footed shot from the centre of the box is just a bit too high. Assisted by Jefferson Montero following a fast break. Attempt missed. Saido Berahino (West Bromwich Albion) right footed shot from the left side of the box misses to the right. Assisted by Jason Davidson. Substitution, Swansea City. Jefferson Montero replaces Wayne Routledge. Attempt saved. Wilfried Bony (Swansea City) right footed shot from the centre of the box is saved in the centre of the goal. Attempt blocked. Wilfried Bony (Swansea City) right footed shot from the centre of the box is blocked. (Swansea City) wins a free kick in the attacking half. Back pass by Ben Foster (West Bromwich Albion). Gylfi Sigurdsson (Swansea City) wins a free kick on the right wing. Attempt saved. Ki Sung-Yueng (Swansea City) right footed shot from outside the box is saved in the centre of the goal. Assisted by Gylfi Sigurdsson.